This magnificent river cruise begins in the ever popular, modern city of Amsterdam, Holland. The best way to see the treasures of this 700-year-old city is on a canal cruise along the elegant grachten lined with homes dating back to the city’s "Golden Age." Cologne, Germany-a 2,000 year-old city known for its gothic archi-tecture-will be an exciting stop with its famous twin-spired cathedral and Old Town with many shops, cafés, and taverns. 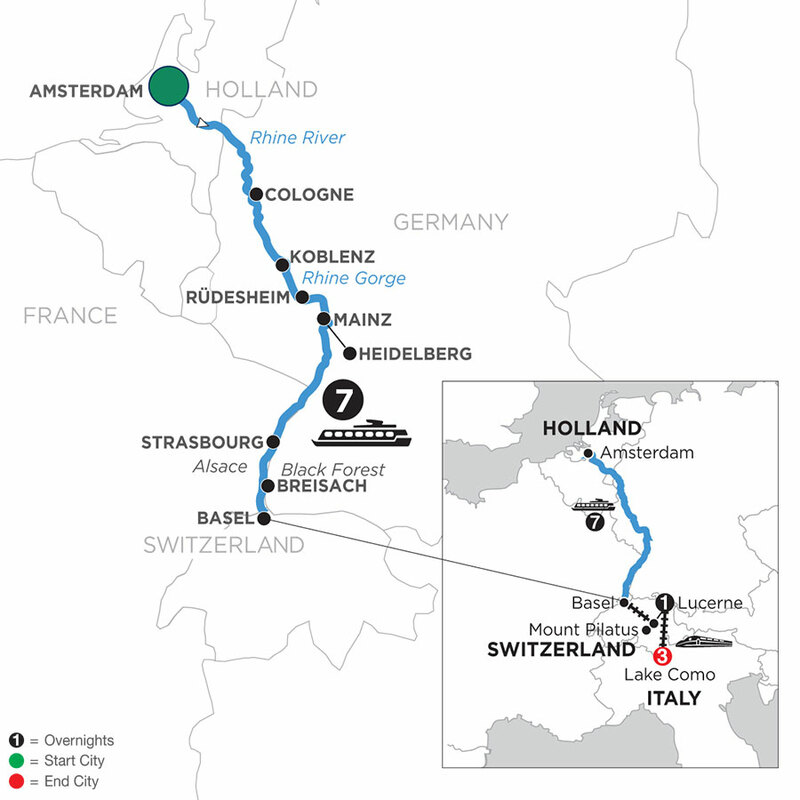 Pass through the dramatic Rhine Gorge-the most beautiful stretch of the Rhine River where ancient castles stand on cliffs 400 feet above the water. And nearby, in the charming wine town of Rüdes-heim, visit the unique Siegfried’s Mechanical Musical Instrument Museum. Continue your Rhine river cruise to Mainz for a guided walk and visit to the captivating Gutenberg Museum, or take an excursion to Heidelberg to visit the ruins of its red-walled castle. In Strasbourg, France, you’ll be amazed by the red-sandstone gothic cathedral with ancient murals and fascinating astronomical clock. Also, stroll through the lovely La Petite France district with its quaint shops, delightful bistros, and peaceful waterfront promenade. Visit Breisach, Germany, the gateway to Germany’s Black Forest-an area of unrivaled natural beauty-best known for Black Forest ham, cherry cake, and the cuckoo clock. Disembark your river cruise ship in Basel and join the Monograms portion of your vacation starting with a special excursion up Mount Pilatus for spectacular Alpine panoramas and a guided walking tour to explore lovely Lucerne. 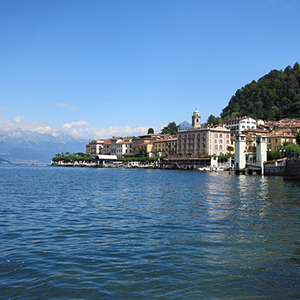 Transfer by high-speed train to Como, where an included guided walking tour features the charming historic district, the gothic Town Hall, and the imposing Duomo. Enjoy a relaxing boat ride on Lake Como to renowned Bellagio with its centuries-old buildings, cobblestone lanes, and charming shops. In your free time, you might like to travel to fashionable Milan, or take the funicular to the village of Brunate-your Local Host® can help you decide how to make this fabulous vacation just perfect for you!